The entertainment lineup at Epicenter continues to grow as festival producer Danny Wimmer Presents announces additional afterhours programming and enhanced onsite experiences, along with food and beverage offerings, at the new 3-day destination music experience. 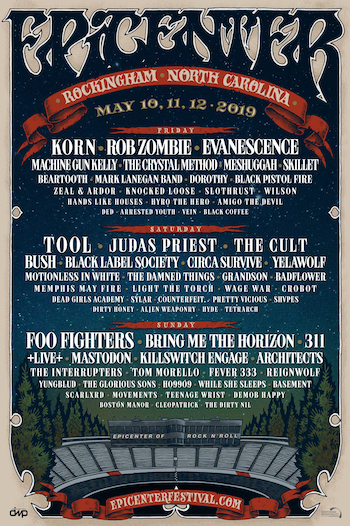 Epicenter debuts May 10, 11 and 12 at the newly created Rockingham Festival Grounds in Richmond County, NC, with over 65 music acts performing on four stages, led by Foo Fighters, Tool and Korn. Additional performers include Rob Zombie, Judas Priest, Bring Me The Horizon, The Cult, 311, Evanescence, Bush, +LIVE+ and dozens more. The expansive Rockingham Festival Grounds—being developed in coordination with Rockingham Dragway, The Rock (Rockingham Speedway), and other local land owners—promise nonstop entertainment, extensive camping options, and no curfew, so the entertainment will continue after the night's headliners have played their last song. The Rockingham Village Stage will be the premier spot for afterhours entertainment throughout the weekend, including an exclusive pre-show party for festival campers on Thursday, May 9 featuring AC/DC tribute act Thunderstruck, Guns 'N Roses tribute Nightrain and local Charlotte hard rockers Killakoi. General Admission, VIP tickets, and hotel and camping packages for Epicenter are on sale now at https://EpicenterFestival.com. In addition to performances from top music artists, and various onsite attractions, attendees will enjoy a variety of local and regional food and beverage offerings provided by DWP's affiliate concessionaire, Southern Hospitality Concessions LLC. Selections from the following local and regional restaurants and food trucks will be available: Auntie Anne's Pretzel Truck, Electric Sliders, Flip Flop Rob's BBQ, Gouda Boys, Grumpy's Homemade Ice Cream, Hibachi 4 Hire, Island Noodles, Master Of Patties, Meltdown Truck, OooWee BBQ, Phat Daddy's Creole, Pie Baby Wood-Fired Pizza, Porchetta Truck, Spicy Pie Pizza, The Berry Patch, Tica's Tacos, Ubora Coffee and more to be announced. Camping at Epicenter will let patrons keep the rock n' roll party going all through the weekend and will set this festival apart from other U.S. rock shows. Camping spots are connected to the festival grounds and include perks like access to showers, portable restrooms, food and drink vendors, charging stations, information and medical services, and the Thursday night pre-show party. Rockingham Village, an impressive promenade conveniently located immediately in front of the venue, adjacent to the North Premium campgrounds, will be open to campers and other festivalgoers until 2:00 AM daily. Featured vendors at Rockingham Village will include festival merchandise, artist merchandise, lockers for rent, lifestyle shopping booths, a full General Store, coffee shop, craft beer at Headbangers Beer Bar, Caduceus wine bar, breakfast vendors for campers, as well as late night food served after the main venue closes. Epicenter sponsors include: Monster Energy, F.Y.E., Fxck Cancer, Zippo, Jack Daniel's, The Music Experience, Sweetwater Studios, USMC, Zyn, Four Saints Brewing and Hugger Mugger Brewing. Epicenter is produced by Los Angeles-based Danny Wimmer Presents, one of the largest independent producers of destination music festivals in America. DWP events include Aftershock Festival, Bourbon & Beyond, Chicago Open Air, Epicenter Festival, Hometown Rising, Louder Than Life, Sonic Temple Art + Music Festival, and Welcome To Rockville. They're also the co-creators of Rock On The Range, America's largest and most acclaimed rock festival, which celebrated its 12th and final year in 2018 with 140,000 in attendance; Carolina Rebellion, which wrapped in 2018 after 8 record-breaking years, including over 100,000 in attendance multiple years at the annual event; and Northern Invasion, which had 50,000 in attendance for its fourth year in 2018. Since 1993, music industry veteran Danny Wimmer has been producing concerts and festivals, both large and small. In 2011, he formed Danny Wimmer Presents, which now produces several of the largest music festivals in the U.S. By combining A-list talent with local cuisine and culture, DWP has become recognized within the industry for delivering the highest-quality entertainment experiences to fans, artists, sponsors, partners and host cities. DWP creates memorable and all-encompassing festival experiences, leaving both consumers and partners with lasting and meaningful impressions. DWP will continue to add new music festivals to its already stellar portfolio, which currently includes Aftershock Festival, Bourbon & Beyond, Chicago Open Air, Epicenter Festival, Hometown Rising, Louder Than Life, Sonic Temple Art + Music Festival, and Welcome To Rockville. Previous DWP festivals include Rock On The Range, Carolina Rebellion, Northern Invasion and more.